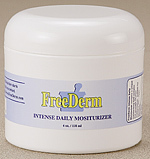 Freederm Eczema/Dermatitis Skin Rash Cream ( 1 ) Jar - - Sent Priority Mail with Delivery Confirmation. The only eczema treatment that comes with a full 100% money back guarantee and is shipped out the same day. Results in as little as 24 - 48 hours. Thousands of satisfied customers worldwide. SPECIAL: But if you order my 'Two Jar' pack - you'll receive not one, but two jars of cream, plus an extra bar of soap and a moisturizer, for only $59.95. So you get 3 extra products for just a mere $20 more. See details below.